Tino Kreutzer is an internationally recognized expert in the fields of humanitarian response and information management. He has more than 10 years’ experience working in the response to humanitarian crises, natural disasters, and global public health emergencies, including in Central African Republic, DR Congo, Uganda, Côte d’Ivoire, Guinea, Liberia, Palestine, Nepal, and Sierra Leone. Tino currently serves as the Crisis Informatics Coordinator at NetHope and is a Senior Advisor at the Harvard Humanitarian Initiative. For the last five years Tino has worked in several leadership positions at the Harvard Humanitarian Initiative and Brigham and Women’s Hospital. At HHI he oversaw the creation of KoBoToolbox, the highly successful data collection suite for humanitarian settings and was also responsible for implementing large-scale population surveys for HHI’s Peace and Human Rights Data Program with more than 40,000 respondents in five countries affected by conflict. He continues to work with organizations such as the UN Office for the Coordination of Humanitarian Affairs (OCHA), the UN Refugee Agency (UNHCR), Doctors Without Borders (MSF), and many other humanitarian actors on improving speed and quality of assessments in humanitarian disasters through KoBoToolbox and other initiatives. 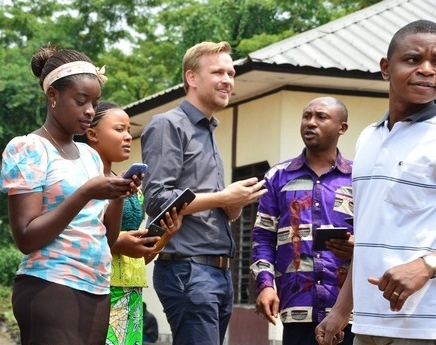 From 2014 to 2015 Tino was seconded to UNMEER, the UN Mission for Ebola Emergency Response where he advised local response teams on data collection and data analysis in the hardest-hit hotspot in Sierra Leone, Liberia, and Guinea. In April 2015 he was invited by UN OCHA to manage population needs assessments immediately following the Nepal earthquake, and by the International Rescue Committee in Turkey to assess refugee flows from Syria and Iraq. Previously Tino worked for UNDP, creating new coordination and information management solutions to track and register former rebels in the Central African Republic during the official disarmament and demobilization effort. With UNDP in DR Congo he created a system to support the fight against sexual violence by improving the way offenses were being tracked in the criminal justice system. Tino is currently a Ph.D. candidate at York University working on deploying next generation technologies for humanitarian response planning and population needs assessments. In 2017 he was awarded the prestigious Canadian Government's Vanier scholarship. His previous academic training is in Political Sciences at Jacobs University and Media Studies at the University of Cape Town, where he published highly-cited research on the emergence of mobile internet usage by low-income youth living in townships. Tino fluent in English, French, German, and Spanish and writes at @tinokreutzer.